Who cares about foie gras? As it turns out, many do. In the last decade, this French delicacy—the fattened liver of ducks or geese that have been force-fed through a tube—has been at the center of contentious battles between animal rights activists, artisanal farmers, industry groups, politicians, chefs, and foodies. In Contested Tastes, Michaela DeSoucey takes us to farms, restaurants, protests, and political hearings in both the United States and France to reveal why people care so passionately about foie gras––and why we should care too.Bringing together fieldwork, interviews, and materials from archives and the media on both sides of the Atlantic, DeSoucey offers a compelling look at the moral arguments and provocative actions of pro- and anti-foie gras forces. She combines personal stories with fair-minded analysis of the social contexts within which foie gras is loved and loathed. 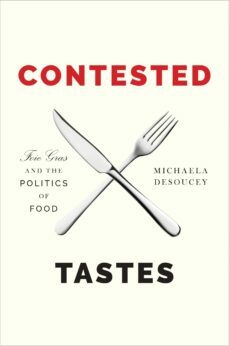 From the barns of rural southwest France and the headquarters of the European Union in Brussels, to exclusive New York City kitchens and the government offices of Chicago, DeSoucey demonstrates that the debates over foie gras involve heated and controversial politics. Her rich and nuanced account draws our attention to the cultural dynamics of markets, the multivocal nature of "gastropolitics," and the complexities of what it means to identify as a "moral" eater in todays food world.Investigating the causes and consequences of the foie gras wars, Contested Tastes illuminates the social significance of food and taste in the twenty-first century.